(TORONTO – March 17, 2014) – The Share the Road Cycling Coalition today welcomed the tabling of the “Keeping Ontario’s Roads Safe Act” in the Ontario Legislature as an important step forward in improving safety and enhancing clarity on Ontario’s roads. Increased penalties for “dooring”, including demerit points to those who open their vehicle door in the path of an oncoming cyclist. Enhanced tools for municipalities to improve safety — contra-flow bicycle lanes, bicycle traffic signal leads that allow cyclists the opportunity to go ahead of motorized vehicles at intersections. The introduction of a one-metre safe passing law. 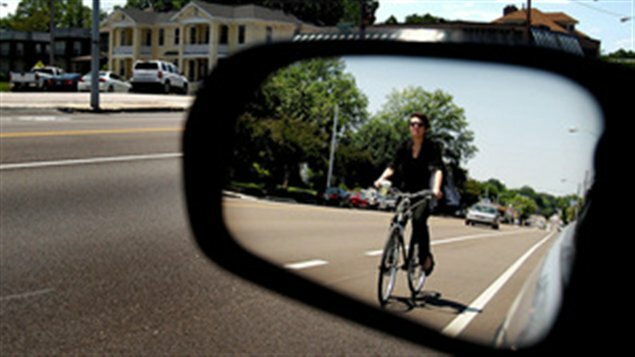 “This Bill will bring clarity to motorists in terms of a safe passing distance, provide municipalities with tools to make cycling safer for citizens, and remind motorists and cyclists alike of the importance of riding and driving safely, and with due care and attention,” McMahon noted. McMahon also highlighted that these legislative changes were recommended in the 2012 Cycling Death Review by the Office of the Chief Coroner for Ontario and have been supported by members of the opposition parties in the legislature through the introduction of Private Members legislation. 5.1 per cent Ontarians (650,000) say they ride a bike daily or almost daily, up from 4 percent in 2012. 31.2 per cent of Ontarians report riding weekly or monthly up from 28 per cent. A majority of Ontarians – 68 per cent — would prefer to cycle more often. This number increased from the 53 per cent of Ontarians surveyed in 2011. 70 per cent of Ontarians believe that cyclists need more bike lanes or paved shoulders and 78 per cent believe that more people would cycle if there was more and better cycling infrastructure. 76 per cent of Ontarians agree that “cycling gets people out of their cars, means fewer cars on the road, and provides more transit choices and that is a good reason for provincial support of cycling in Ontario”. 73 per cent agree that health benefits and reduced healthcare costs for Ontario and that is a good reason for provincial support of cycling in Ontario. 71 per cent agree that cyclists are taxpayers too, have a right to use the roads, and a portion of provincial funding to roads should be earmarked to meet cyclists’ needs. 89 per cent believe that the Ontario government should fund local active school travel efforts, including the development of school travel plans for schools across the province. The Share the Road Cycling Coalition is Ontario’s cycling advocacy and policy organization created to unite cycling organizations from across the province, work with and on behalf of municipalities to enhance their ability to make their communities more bicycle- friendly and advocate for an enhanced provincial role. Core to the organization’s mission and mandate are safety, education and awareness campaigns. Kaitlynn Dodge, Brown & Cohen Communications & Public Affairs Inc. 416-835-0257 kaitlynn@brown-cohen.com (on behalf of Share the Road Cycling Coalition).